Stoller Farms is a nearby neighborhood that has an annual garage sale day where many of the neighbors have their sales on the same day. This year it was a particularly fine morning when I headed out to search for lounge patio chairs and a keyboard. 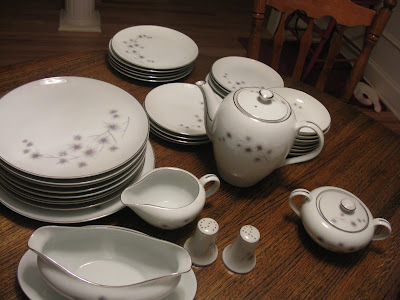 I parked my car near the entrance of the neighborhood and the first sale had this lovely set of china for $25! 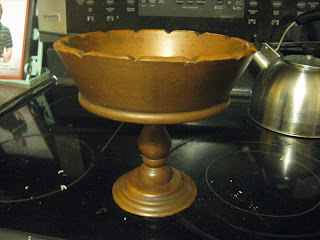 I fell in love instantly and $25 for a 35 piece set including a coffee pot, creamer, sugar bowl and gravy boat is a very, very good deal, but I had a $300 worth of bark dust coming the next day and couldn't afford to be frivolous. I kept walking. I found some lounge chairs for next to nothing and then when I headed back to my car there was the china still sitting there. And so I bought it. As we wrapped the dishes in newspaper and packed them in a box I had a lovely chat with Ursula who told me that the china had belonged to her uncle and his wife who lived in Grande Ronde and she inherited it when they passed. I love that it is part floral in a dandelion seed parachute and thorn sort of way but that is is also very mid-century with a star burst design. The pattern is by Creative pattern # 1014 and is called "Platinum Star Burst." I can't find out the date but one site had a set with a date of 1935! To me it says "Starlings"
When I had it in my possession I examined it further and really appreciated grey, grey blue, brown grey and the raspberry centers! It was then that I knew that I had found the inspiration piece for my kitchen. You can see from the top photo that I have a very nice selection but not quite a full set. I am missing bowls, teacups and saucers, dinner plates (thought I do have luncheon plates) serving bowls and platters and a teapot. But I do have a coffee pot with the usual accompanying pieces and salt and pepper shakers. I didn't even know that they made matching salt and pepper shakers for china patterns. So my dear friends, family and readers I ask most humbly for you to keep your eyes open at your rummage sales, thrifting excursions, antiquing and the like for pieces to fill out the collection. I would love to have a full set. It would be a great thing to remember for gifts (hint) and you can buy some pieces on-line. Etsy seems to be reasonably priced but some places are exorbitant. I am pleased to report that my bargain basement garage sale price works out to 71 cents a piece (71 cents for a coffee pot!) Oh, how I love a bargain. I can hardly wait to pull these out on special occasions. 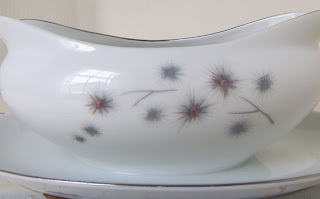 Next, I need to choose a star burst-y flatware pattern and find a pretty cabinet to store and display my pieces. While I am grateful to the Royal Wedding for the inspiration I think I improved on the design. I am very, very happy with this dress. I used the the bodice and sleeves from Vogue 7681 heavily altered for Nutmeg's slim shoulders and made up the rest. 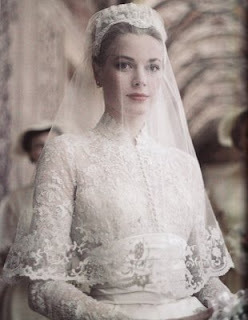 I liked the box pleats and the scalloped lace on the royal bridesmaid's dresses but thought that the very plain bodice, structured sash and leg o' mutton sleeves to be too stiff and not romantic enough. Vogue 7601 has princess seams on the bodice and the sleeves are so delicate. There are about 8 layers of tulle underskirt but the dress works best with a nylon petticoat beneath it. When I made Vogue 7681 for Nutmeg 3 years ago, it was made from a very stiff taffeta and the sash and bow were very stiff and I loved them. This sash is made from duponi and has a heavenly drape. I love it too! When it was nearly finished I decided that the bodice needed a little bit more so I added the lace at the neckline. Just so. 3 rosettes made in the Demi-millinery style and out of a double thickness and no raw edges finish the details. find a home for all the flotsam and jetsam of the kitchen hot spots and clutter piles. But this was the fun part. It is exactly what I wanted, part apron part t-shirt dress. I don't care if it isn't flattering or that Moose will loathe it. Light and airy and completely kitschy, it is a theme dress for when I am feeling particularly granola. I made it out of a down east basics shirt that had a bleach stain on the belly and good old fashioned gingham check. I don't know what to call it. In the photo I am trying to decide what I am planting in the garden, but on the whole this dress reminds me of sappy 70's songs and films in meadows with fuzzy lenses. Shall we have a contest. What shall we name the dress? Day 3 involved me, a high chair a wooden compote and 2 cans of spray paint. The Samurai Mom's Color of the Year goes to .....*drumroll*......Raspberry! Last year's color of the year was Starlings Green, this year is it raspberry. and then last weekend I found a china set (Creative Platinum Starburst?) at a garage sale and loved the color scheme. Before I had the box out of the van and into the house I had decided it would be the perfect inspiration piece for my kitchen! What is that in the center of the grey starbursts? Oh, RASPBERRY! and dedicated the compote to a life in pink. Then this evening La Keira came over and we pawed through my fabric stash and found this perfect fabric that I got from my mother-in-law. It has the perfect shades of grey and raspberry. I had planned for it to become a blouse but as you see it is now a curtain to hide the recycling! Next step: paint for the kitchen walls! It doesn't look like much right now but I have high hopes for this warm south facing tomato bed. Viva los tomates! The pictures aren't fancy but for day 2 I finished planting the tomatoes and put mulch in the strawberry bed. After mulch. Also note a few violas growing in the border. I also finished moving the tulips that were coming up behind the hedge along the deck to the front of the hedge. Maybe next year, with a chance at sunshine they will bloom. There is no photo of this because it is not visible. Just how much bark dust is 1.5 units? Use the 5 year old for reference. That wet spot on the road is where the bark dust USED to be. Thoughts on "The King's Speech"
Colin Firth in a kilt. Discuss. Jennifer Ehle and Colin Firth on screen together again. Discuss. The years seem to have been kinder to Colin Firth than Jennifer Ehle. Makeup or age? Discuss. Helena Bonham Carter was neither insipid or creepy as I feared she would be. Worst Winston Churchill portrayal ever? Likely. I want the shabby wall in Lionel's office. Moose said "No." The "scene" Oh. My. It was nothing. It was even interlaced with British swears which are so ridiculously funny that you weren't even offended by the real swears. Seriously, this movie would have a PG rating if not for that scene. I think a brief discussion with the kids about how this is not appropriate language even for adults and why it is not appropriate would be fine. You could also mute it and not miss the impact. Overall it was a really good story about courage, trust and duty, but NOT a good film about stuttering. As the mother of a stammerer I was very annoyed that the film insinuated that the MAIN cause of stuttering is a trauma of some sort. That is NOT TRUE. It may be the cause in some cases but not in all or even in most. 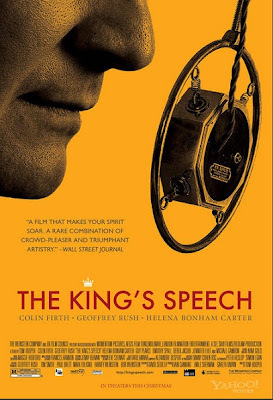 I realize that this is a historical film espousing the science of the time but most people don't know anything about stuttering and will not know that the film's message about stuttering is outdated. Every parent of a stammerer is afraid that something they did caused their child's dis-fluency and it is unfair to perpetuate those false fears. What parents of stammerers do need is immense gifts of patience from the almighty and a loving "listening" face. If I ever hear my kid or anyone else's kid making fun of a child's stutter like David did of Bertie's. They are going to get a tongue lashing that will make them wish THEY had never learned to talk. 5 out of 7 thimbles. Happy Anniversary! Starlings has belonged to us for 1 year today. That was a very happy day, we have been so blessed and I have been grateful every single day. Starlings, May 10, 2010 in the a.m. I spent the mid-day moving mis-placed tulips and weeding in preparation for the great bark dust dump scheduled for this weekend. The azaleas are the only thing in bloom just now but they are brilliant, there are a few last tulips that haven't died yet and the poppies and iris are taunting me. I can't wait to eat from the gardens. Last night I made a very small rhubarb crisp, it was the first rhubarb harvest at Starlings and the first harvest of the year from the gardens. Happily, (considering my sketchy history with crisps) it was a success. Starlings, May 10, 2011, 3 pm. With 3 bickering children. The sun has come out, the birds are singing and I am typing this on my porch. The kids are running and laughing and swinging. How did I like the wedding? I don't know what there is to say that hasn't already been said but I will add a few comments. Maria Von Trapp's in the Sound of Music. 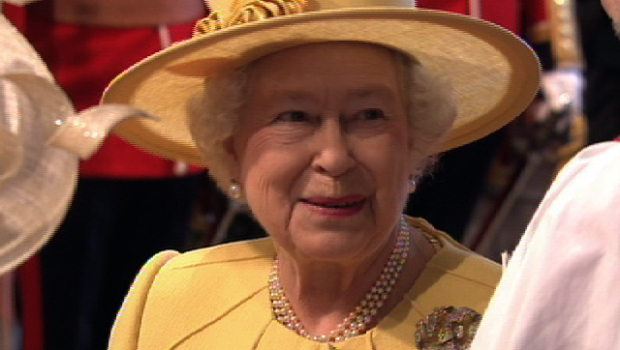 Nothing says "I am the future king of Great Britain" than a red uniform. I happen to be making a flower girl dress for Nutmeg this month. 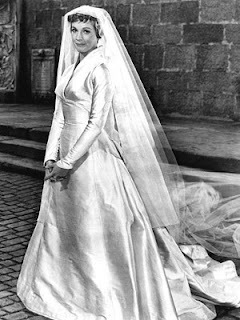 Don't be surprised if it has puffed sleeves, box pleats and a scalloped lace underskirt. Loved the trees. I think we should all start investing in potted trees for weddings. It's going to be huge. The kisses: They were adorable and we waited long enough for them! The service: I am glad that it was religious but it was so boring and long! 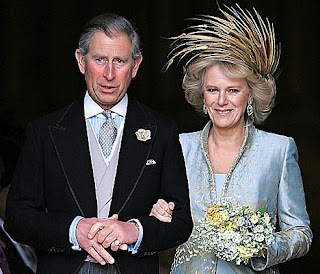 The hats. 50/50. About 50% were cute and 50% were hideous. Only a handful were as awesome as the one I wore to the viewing party. 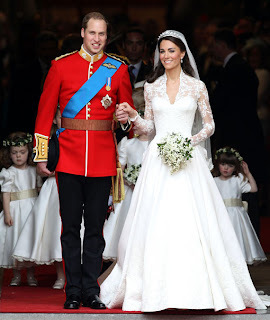 Criticisms: I would have liked to see Kate smile a LOT more during the walk/ceremony/service she seems like a charming gal not too terrified by the spotlight so I can't understand why she wasn't grinning from ear to ear on her wedding day. She smiled in the carriage would it have killed her to do it in the abbey? I was hoping for something as stunning. Heels. I would think that someone would have taught the Royals and royal relations how to walk in heels. They all looked SO uncomfortable and bow legged in them. Kate, Pippa and Her Majesty excepted. And as someone commented on Facebook "The York girls should not be let out unsupervised."